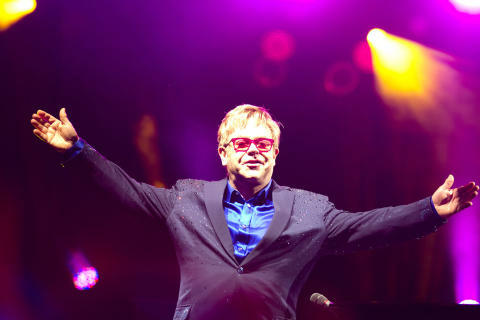 SportsAid has today launched its Elton John Sports Fund with more than £300,000 raised at an acclaimed concert by the artist at Stoke Park in Buckinghamshire on Saturday June 28. The fund will support some of Britain's brightest prospects from more than 50 sports by providing annual awards of £2,000 to help with essential training and competition costs. "Thanks to your support," Elton said to a crowd of 5,000 fans during the concert, "we will be able to fund young athletes for the next eight years to help make their dreams come true. Thank you!" One of the first SportsAid athletes to benefit from the Elton John Sports Fund is 16-year-old rower Molly Harding from High Wycombe in Buckinghamshire who had the privilege of receiving her cheque from Elton just before he went on stage. Molly said, "Never would I have thought that I would be receiving this award, let alone receiving it from the man himself! To know that SportsAid and others see this potential in me really gives me that encouragement to believe that I will be next. The whole experience was very overwhelming." She added, "This support has come at a time that I need it most. With events that I'm hoping to be selected for such as the world junior rowing championships I'm going to need this money to help pay for the costs of travelling." Also receiving £2,000 cheques from Elton on the night were 17-year-old sprinter Daryll Neita from Lee in south east London, 14-year-old swimmer Holly Hibbott from Southport in Merseyside, 17-year-old sprinter James Arnott from Plymouth in Devon and 15-year-old cyclist Fred Wright from Herne Hill in London. 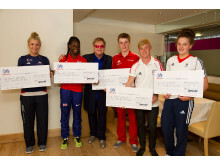 On meeting them Elton said, "It was a special moment to meet the first five young athletes to benefit from the fund. Their successes are already very impressive, and with a little extra help and recognition who knows what they could go on to achieve. They are the reason we were all at Stoke Park for the concert. Working with SportsAid, we know we are helping the right athletes at the right time." Former SportsAid beneficiaries who were there to pledge their support included Steve Redgrave, Katherine Grainger, Keri-Anne Payne, Ade Adepitan, Mark Foster, Derek Redmond, Gail Emms, Duncan Goodhew, Danny Crates, Anna Watkins, Mark Hunter, Zac Purchase, Richard Hounslow, Sarah Winckless, Shelley Rudman, Heather Stanning, Karen Pickering, Beth Rodford and Steve Williams. Zac Purchase said, "I remember receiving my first SportsAid Award as a young athlete and it is one of those wonderful moments in life when someone turns around to you and says, 'you know what, we think you could be good'. And now you look back at SportsAid's alumni and how many of them go on to achieve great things, and it just goes to show that SportsAid gets it so right when selecting which athletes to support, giving them the confidence boost to go out and perform even better in the future." During a superb performance Elton John treated the crowd to many of his best hits - including Your Song, Rocket Man and Don't Let The Sun Go Down On Me - to a fantastic reception. 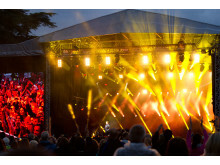 "Such a great show at Stoke Park last night," said Rob Smith from Laurent-Perrier. "Great support for SportsAid and a night that will live long in the memory." World canoe-slalom champion Richard Hounslow tweeted, "The @TeamSportsAid & @eltonjohndotcom put on an amazing show last night. #ForTheNextGeneration." 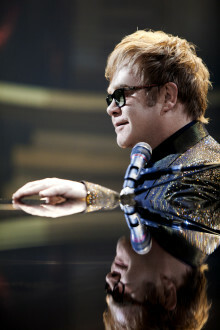 "We had a great night on Saturday," Elton said after the concert. "The place was buzzing and it was fun to see so many Olympians and Paralympians dancing in amongst the crowd. What a great way to help our next generation of champions." Call Simon Worsfold on 020 7273 1978 or email simon@sportsaid.org.uk. Caption: Elton John thanks the crowd at the concert for SportsAid on 28 June 2014 (credit: SportsAid/Ingrid Abery). Photos are only released for use in relation to this story and may not be used for commerical or other purposes. sportsmen and women who aspire to be our next Olympic, Paralympic, Commonwealth or world champions. SportsAid's patron is Her Royal Highness the Duchess of Cambridge. At London 2012 almost two-thirds of the British team were former recipients of SportsAid's support, winning 20 of Team GB's 29 gold medals and 27 of ParalympicsGB's 34 gold medals. 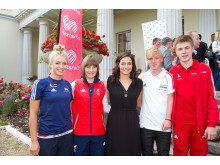 The athletes supported by SportsAid are typically aged 12 to 18 and are among Britain's brightest hopes for the future. The SportsAid Awards they receive are funded by the charity's donors and supporters. They recognise the athletes' achievements and help them meet the high costs of training and competing, which they otherwise have to pay for themselves. SportsAid ensures the right people get the right help at the right time by working with the governing bodies of around 70 sporting disciplines to identify those with the greatest potential. As well as providing SportsAid Awards to help young athletes meet the cost of sport, SportsAid also manages the Talented Athlete Scholarship Scheme (TASS), which provides specialist services to athletes in higher or further education. For more information visit www.sportsaid.org.uk, follow @TeamSportsAid onTwitter, contact the charity on Facebook, or sign up to receive its monthly newsletter.